This configuration starts a silo listening on port 30000 (ProxyingGateway), and other silos can talk to it on port 11111 (Networking). It also identifies a SeedNode, which is the primary silo in the cluster. The seed node address and port match those specified for this silo, which makes this the primary. You’ll also notice the Override section at the bottom, which specifies the same ProxyingGateway and Networking ports again. This allows us to use the same configuration file for both a primary and a secondary node, as the other settings will be the same (they must all specify the same primary (seed node)). To make use of the override, when you start the silo, just specify the name as the first argument. You can also specify the configuration file you want to use, in case you have several (the default is OrleansConfiguration.xml). Interestingly, when starting a number of silos it only seems necessary to tell a client about one of silos (a primary or secondary) it seems to figure out the cluster members automatically. 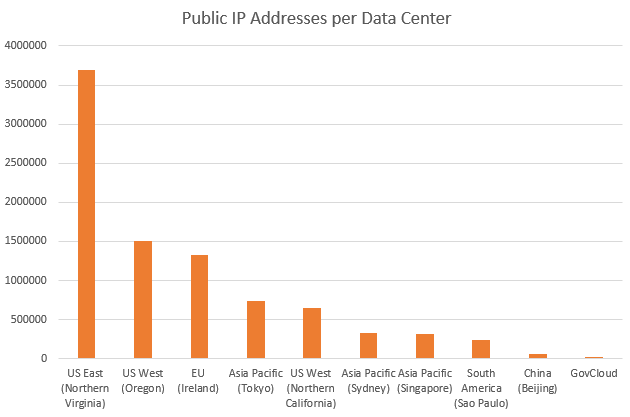 I previously blogged about the public IP address ranges for Azure. The public IP addresses ranges for Amazon has recently been updated. Amazon has over 8 million addresses, which is 8 times the number Azure has. I have also updated my tool to look up which DC a website is hosted in, to include the Amazon IP ranges. One of the things I like about Nancy is the ease of creating self hosted HTTP services. Here’s how to enable HTTPS for your service. Then go to ‘Manage Computer Certificates’ in the start menu (I’m using Windows 8.1). 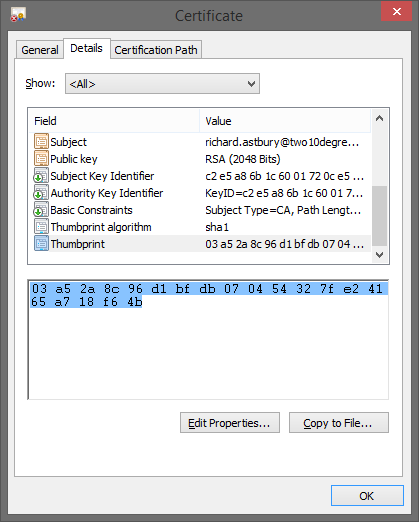 Right click on ‘Personal’ and import the freshly created mycert.pfx. The appid is just a random guid, feel free to create your own. Now start nancy on this Uri https://localhost:4443/. How to check that HTTPS request working in Nancy Host or not? send it an HTTPS request from your browser? I send request from browser. but i got no response. Sounds like it didn’t work. Try putting some logging in your app, and looking at the HTTP traffic in fiddler. Let me try once again.. I created new certificate and then i register them successfully. Then I use browser to send https request and apply break point. But it was not working. Getting error HTTP Error 503. The service is unavailable on browser. Can you guide me how i can get response using HTTPS. I am able to create certificate and able to register it successfully. But when i restart computer, Then nancy started but url related to nancy not work. I try to find the solution. But got no solution. After that it work. But after restart again i have to use same command. Thanks for this post. Really helpful! 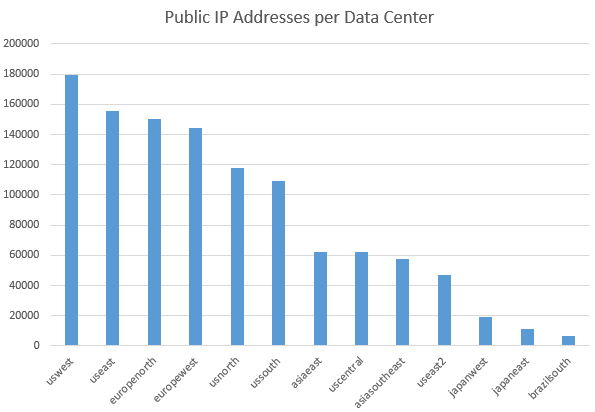 Microsoft publish a list of public IP addresses for the compute services hosted in their Azure Datacenters. When they say ‘compute’ they also include SQL Database, and the storage accounts seem to be included too. I thought it would be interesting to write a script to count the total number of IP addresses available for each DC. Whilst the number of public IPs is no way of working out the number of machines provisioned in each DC, it does at least give you an idea of the magnitude of each of the regions. The EU data centers are similar sizes, Dublin being slightly bigger. The 5 DCs in Asia, Brazil and Japan added together are smaller than US West. The total number of IPs is just over 1 million. There seems to be a step change between the largest 6, the next 4, and then the 3 small (and new) DCs in Japan and Brazil. US West is 28 times larger than Brazil South. Almost 60% of the IPs are in the USA. I think it will be really interesting to keep an eye on the IP ranges, and see how they change over time (or is it just me?). I also published a tool to look up if an IP (or domain name) is hosted in Azure, it also tells you which DC it’s in.